germ@namur: De Leute in Leuven! Some people have several said to me: “What? 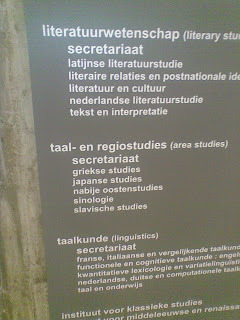 Leuven, it’s not an Erasmus!” I totally disagree with that way of thinking. I must admit that Leuven is still in Belgium but I really felt that I was living an Erasmus experience especially when walking in Namur and hearing French words became a strange experience. It’s true that I was only sixty-two kilometers far from home, but I discovered a lot of things in that town. 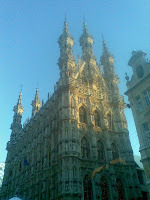 I learnt to know a different region in my country and I am really glad of it because I now see Belgium differently. An Erasmus is not only a matter of improving a language. Indeed, I gained also in autonomy, I discovered a new culture, a different way of learning and I met new people. By the way, I have to say that Flemish people are not cold (contrary to what I heard about their way of behaving). I met there the most spontaneous person I’ve ever seen. She had always something interesting to say, she immediately spoke with me the first day of my arrival and she was really kind! So don’t rely on what people say, just go there and see by yourself! What can I say about Leuven? I would say that it’s a beautiful town. It’s not so big, only two kilometers in diameter but there is a lot to see. If you happen to walk in the beautiful streets of this town, I recommend you to pass by the Stadhuis, which by the way was magical at Christmas time, Sint-Pieterskerk, het Groot Begijnhof, de Centrale Univesiteitsbibliotheek and to eat and drink something on the Oude or Grote Markt. The centre of Leuven is really picturesque, especially during Christmas, when all is illuminated. Nevertheless, you have to be careful not to crash into a bike, because they are completely inherent to the city; which is the reason why you get a bike riding lesson in the beginning of the year if you are an Erasmus student. I did really want to have one but after having heard about all the fines (and the total amount of them!) that you can get with a bike, I chose to move on foot. You should however remain cautious, those vehicles are really dangerous and I was very close to make an accident with one of them on several occasions. One of the many reasons for which I chose Leuven was that I had heard that the administrative stuff was easy to regulate and I can definitely confirm this. The service of Erasmus students is just perfect. We had an Erasmus coordinator and she was always available and ready to help us. I heard that some students were not as lucky as we were but at the KUL, they answer to your mails very quickly, they check all the official documents that you enter, they organize info-sessions about the exams, the courses,… It was really reassuring to know that if I had any problems, they would be there to help me find a solution. The housing service is also particularly well-managed. I went to it on 28th July in order to know what I could do to find a room. Somebody gave me a dozen of sheets with all the rooms that were available during my stay. All I had to do was to visit the rooms, to choose a street and the amount of the renting and it was done. My room was in the Kortestraat. This street is really great and very lively. 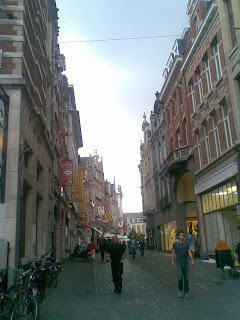 It was in the centre of Leuven between the Oude Markt en Grote Markt and I felt really safe. 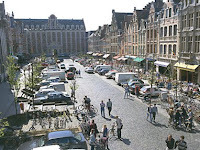 That aspect was really important to me, and Leuven responded fully to my hopes. The town is guarded by dozens of policemen. They are really part of the landscape and that was quite reassuring. I thus advise to choose a room in the centre because it’s better to walk ten minutes to go to your class and to be close to the “going out centre” than the other way round. My building counted thirteen or fourteen rooms, so that it was difficult to feel really alone. I got on very well with one of my roommates and we saw each other very often. Sometimes we chatted in one another’s rooms, sometimes we went out,… She taught me some words in “West-Vlaams” as “De leute” which means: “Have fun!”. I knew that several dialects existed but I didn’t realize how different they were. I didn’t understand everything when somebody spoke to me in dialect but I didn’t feel guilty since my roommate had told me that she didn’t understand her fellow students when she arrived in Leuven. The KUL offers you a lot of things that are really useful during your stay: busses and sport card are free and you can posses a culture card for only fifteen euro’s. So Valentine and I went to play basketball every Monday, and I’m now very familiar with basketball vocabulary. As far as the academic stuff is concerned, I followed five courses: Populaire genres, Nederlandse volkskunde, English linguistics: synchronic –theoretical, Mediasociologie and Communicatiewetenschap. My favourite course was undoubtedly communicatiewetenschap! I really appreciated this course because I learnt a lot about aspects of communication that are relevant to my present and future life. I learnt to be critical of the media, also to be cautious and I discovered aspects of human behavior that I didn’t know. It was really interesting and even though the exam was quite difficult, I warmly recommend this course. Mediasociologie was also really interesting. We studied the media in the frame of different aspects as age, gender, social class, education,… We had broad possibilities regarding the courses to choose and that is also a reason to go in Erasmus: it’s the occasion to get familiar with different subjects. Last year I read all these articles to choose my destination and to reassure myself, so I will address this last sentence to all the students who may want to study in another university in the future. I must admit that I sometimes felt a bit anxious or alone because everything was so new, but now that I think about it, I’m really glad to have lived in another town during five months and I really enjoyed those moments. It’s a once in a lifetime opportunity and you have to take it because the KUL, and all those universities, can bring something new to you, and you won’t see your life in the same way after such an experience. A last thing that may be useful to know is that if someone is trying to “chat” you “up” and that you are not interested, don’t use the excuse of “I’m an Erasmus, I don’t speak Dutch” because they will switch in French or English. Flemish people are often bilingual or trilingual so think about it and don’t overuse that sentence!